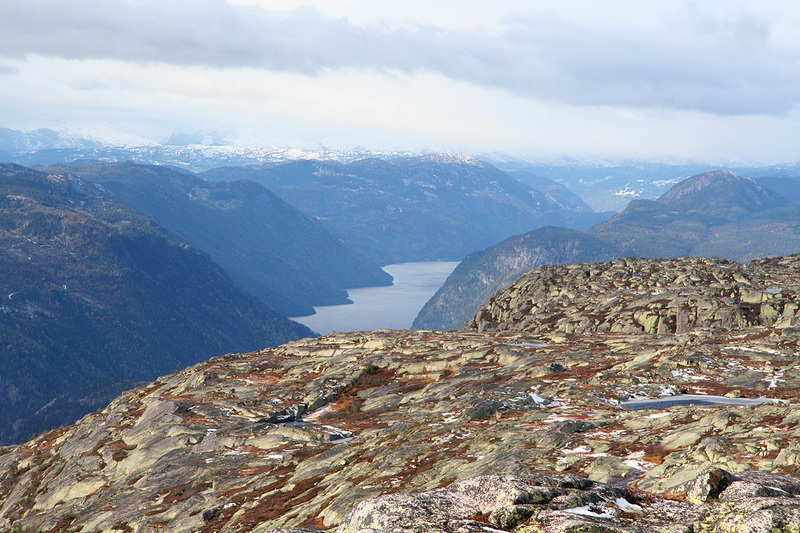 How to get there: This mountain is located in Telemark. The main Hwy. running between Drammen and Haugesund is E-134. Locate the intersection at Brunkeberg where Hwy. 41 forks south to Kristiansand. Drive south to Kviteseid and continue a few more kilometer. Just before the Hwy. makes a right turn onto a bridge, exit left and park. There is a closed gate right ahead, but the area just before the gate is wide enough to accommodate a few parked cars without causing any problems. This is the trailhead, location is N59:22.383, E008:32.084, elevation approximately 93 meter. Route description: Hike up along this well maintained dirt road as i climbs in a couple of turns. Continue uphill along this road until its highest point. As the road begins a gradual descent, look for a forest road that forks off on your left side (you have already passed a smaller road that forked right). Follow this road, first fairly flat then uphill as the road climbs steeply. Higher up, there are a couple of switchbacks and a road that forks left, however you should continue on the main road (keep right). Continue uphill as this road enters a small valley and eventually crosses a creek just below a forest cabin. This is Tarren, location N59:22.103, E008:35.255, elevation about 557 meter. At the upper corner of the cabin, a forest track continues uphill. After only about 25 meter, a faint trail forks left and runs more straight up the hill. Try to find and follow this trail. Following the forest track will also work. Either way, climb a broad ridge with sparse pine trees as you get higher. You can now see the mountain above you. The actual summit is visible as a distinct cone quite a bit to your right when facing uphill. From here, there are a few different choices. One can obviously try heading more or less directly towards the summit, or one can climb higher on the mountain, more directly uphill, then traverse right higher up. Either way, you are likely to run into some cliffs and rocks scattered along the route. There are numerous ways around these obstacles, some may require a bit of light scrambling. When just below the final summit cone, climb the last stretch to the top cairn. Again, there are several options here with difficulty in the YDS class 2 or class 3 range, depending on your choice. 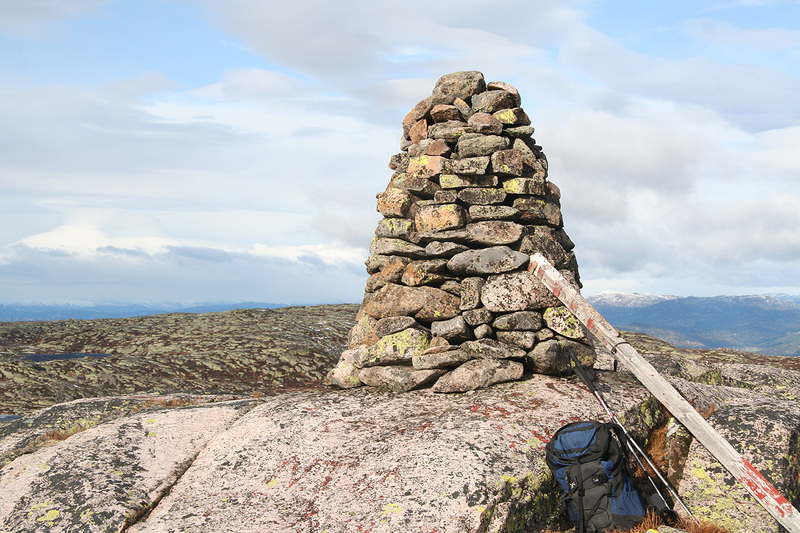 The summit has a nicely built cairn and a very good view. Comments: I did this hike with my son Tor Erling. After a nice stay at the old Seljord hotel (since 1859), we were parked at the trailhead at 0900 and ready to go just about 10 minutes later. We hiked up the forest road, but took a faint trail that forked right in a big left curve. This was obviously a mistake and led us into some rather steep terrain before we hit the forest road shortly before its end at the forest cabin Tarren. From Tarren, we headed uphill along the forest track, we did not notice the faint trail that went more directly uphill. We continued more or less directly up across the cliff bands and did not really pay attention to the summit location before having reached the main crest of the mountain. We were now about 1400 meter off, actually near the lower, west summit. Hiking across to the main summit was not hard, but did involve a bit up and down as there are a few gullies that run across. We had only about 5-10 centimeter of snow, far less than yesterday despite being somewhat higher. 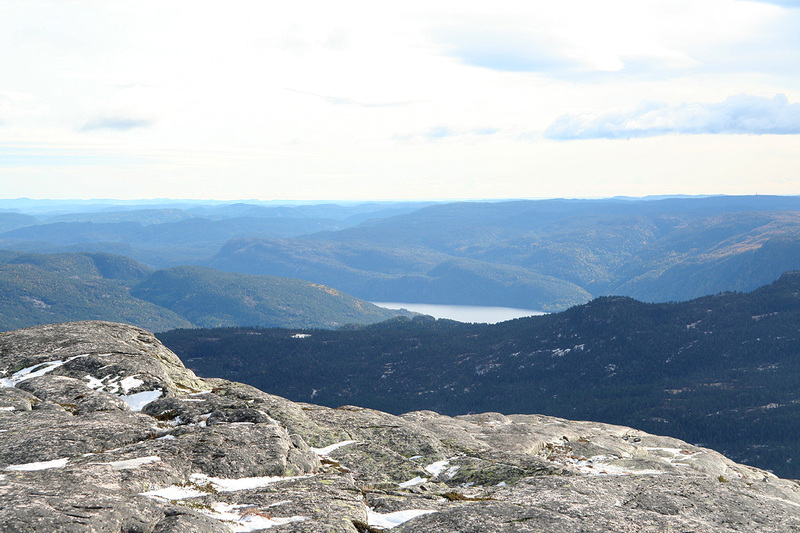 We arrived at the cairn shortly before 1300, and took some time to enjoy a very nice panorama view. The blue, sunny sky that we had on our ascent quickly gave way to clouds and the wind really picked up in strength. Thus, when we left the summit around 1315, the wind felt really cold. We returned along a slightly more direct line and arrived back down at the car around 1400. The next task was driving to my mountain cabin in Lillehammer where we arrived for a late dinner shortly after 1900.